Even though it has now started to really feel like winter has started to show up a little more lately, we are better prepared then last year. Last year we installed a 30k BTU propane wall heater that performed pretty well for us but quickly found out that the cost of propane would prohibit us from using it as our primary head source. So when the Tractor Supply Center got their supply of woodstoves in we got busy. 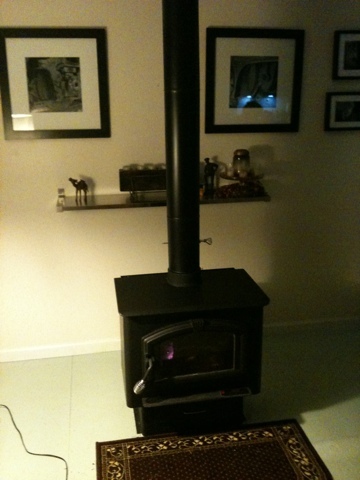 We got a good stove, the double wall pipe and the flashing kit and on a clear Saturday completed the installation. It was the best thing we did all year. Now the priority is to make sure I have a good supply of seasoned wood to get through the Winter. Last Saturday morning was the coldest morning so far and we are only getting started. The brisk 17 degrees could have been harder but the wind was not blowing. Lucky us. Last week we finally received the last of our solar panels. The system is a full 3.7 kw. I know that doesn’t mean much to most of you but when we originally designed our PV solar system I knew right away I would be “building” it in stages. We just didn’t have the money to get it all at once. Although I don’t think we will ever be completely finished. 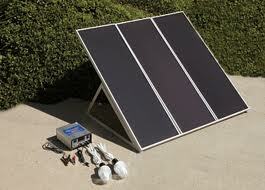 Next year I hope to get a solar hot water system ordered and start that install. Right now we have a propane tank and I would rather let the sun heat the water and that would easy my wallet on buying propane. I also may start thinking about either a small wind generator or a micro-hydro to help keep the batteries charged on the short winter days and the days of heavy clouds. We seem to only get some wind in the winter and our stream only flows when it rains – heck it may take both systems who knows. I do know that next week will be time for a load of donkey manure for the garden thanks to John and Carol and “Buck and Doe Run”. Well the short days and lack of sun has forced me into action. 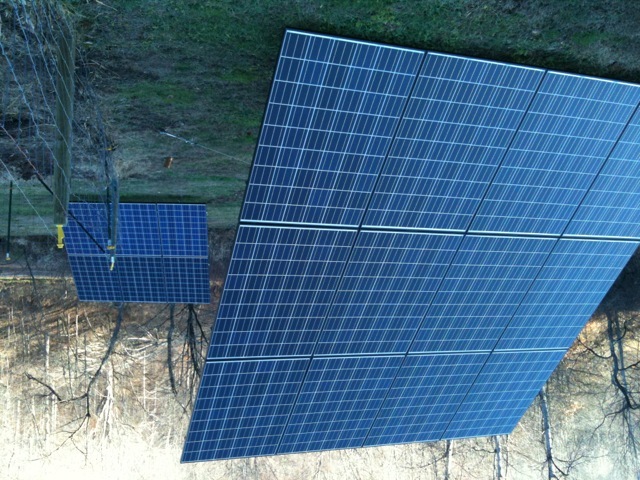 We received our Harbor Freight solar panels and Saturday we got them installed and running. I only added a small lawn mower battery to the kit. Hopefully it will help the chickens think there is still light and help to keep their egg laying steady. Only time will tell now. This morning started out like most mornings. The thermometer read 20 degrees this morning, so the first chore of the day was to stoke up the fire. We have been leaving the chickens in the coop until about ten o’clock so they will lay their eggs in the nesting boxes. All six of our hens are laying now. My cousin is out of town for a few days so I had to go over to his farm and feed up the donkeys, goats, and barn cats. I can’t forget Sandy their fat Lab. She will be waiting impatiently for her breakfast. I always take Ruby with me so they can have a visit and a little playtime. Nothing else was on the agenda today, so I thought I would can up one of those Cushaw pumpkins Vickie gave us. I got all my canning supplies ready and sharpened my knives. Apparently I sharpened them too well because I ended up slicing my thumb. I got the bleeding under control and put a bandaid on. Tough to do one handed. It still wanted to bleed, probably because I have to take an aspirin a day and it thins the blood. My pumpkin lay there on the table cut open with seeds spilling out. I had to finish the job or it would spoil and go to waste. The best thing I could think of to do was put on a plastic glove and finish canning the pumpkin. It worked great. I canned ten pints. I’m usually very careful, but today was just one of those days. I went to take a lid off of a pot, without pot holders ( idiot) and the steam burned my fingers on my right hand. So, now both hands are bunged up. I hurried up and cut a leaf from my aloe plant to put on my burning fingers. It immediately soothed them. They burned most of the afternoon, but I kept applying the aloe and now they feel fine. Later on I noticed one of my hens was not hanging with the rest of the flock. Went to check her out and noticed that she was limping and had a tear in the skin on her back near her wing. A chickens skin is very thin. I’m not sure what caused it, but I suspect it could be from the Roosters jumping on her back. The poor thing looked pitiful. I was able to catch her by throwing a towel over her. It was hard to tell the extent of the injury while trying to hold her covered in a towel. Mind you my hands were not in good working order, but I was able to clean the wound with warm soapy water and peroxide. She will have to be separated from the flock or they will begin to peck at her if she shows illness. I put straw in our large dog crate and gave her some water. That’s the best I can do for her. I will be surprised if she makes it. Chickens are susceptible to shock and infection. Most injuries are fatal. We can only hope that she will recover. It’s painful to see my animals hurt, but that’s part of farm life. Injuries are bound to happen and out here and you have to be able to take care of them yourself. After the events of today, hopefully I make it to bed without stubbing my toe or having to bandage a bloody dog paw. Last week Sonny and I became first time grandparents. Our son and his wife blessed us with a healthy and handsome grandson. We couldn’t be more happy or proud. Most people like to say “boy your getting old” or “does that make you feel old.” The answer is no. Not at fifty anyway. I have no way of knowing what I might feel at sixty or seventy, but so far I’m grateful to have reached this age. I think I will be happy to reach those milestones as well. We all wish we were younger from time to time. We wish our bodies didn’t hurt, or that everything would work the way it used to. Some people are obsessed with getting older and fight it by getting Botox injections and body work, but that’s just a paint job on an old vehicle. Unfortunately people can’t get new engines like cars. What is a show piece if it has nothing inside. Yea, we have a few dents, the paint job is faded and the engine might have a miss, but we’re still chugging along. Although we are slower and the young sports cars fly past us we can still go on an adventure. There are still new experiences around the corner and things to be learned. Getting older does not mean your dead and I doubt when you crossover that great divide your thinking, man, I’m too old to jump this. Getting older is an inevitable fact of life. Embrace it, laugh at it, live it, enjoy the gifts that it brings, like grandchildren and wisdom. I’m sure our new grandson will have much to teach us over the years. Like his great grandfather, grandfather, and father before him, he will know everything. A veritable know-it-all. I hope he inherits his mom and dads sense of humor, that he is tender hearted, and unselfish. I hope he grows up to be good man like his father and if him growing up makes us grow old then so be it. It is the circle of life. Hopefully he will love us the way we are. Sonny (Pop) will tell him silly jokes, teach him how to hunt, give good advice, and well… tell more silly jokes. Me (I don’t have an official title yet ) will be the plump little grandma that makes him cookies, teaches him to love animals and music, and will get on the floor and play cars or climb a tree house. I just have to oil the old joints up first. He’ll get lots of grandma hugs and kisses and of course be the shining star in our eyes. Becoming a grandparent is another phase on this journey of life. I wouldn’t want to miss it for anything. Do I feel old? No way. I take life one day at a time. Today I’m a grandmother. God willing someday Sonny and I will say “We’re great grandparents.” Won’t that be something? We have had our first snow dusting of the season today. 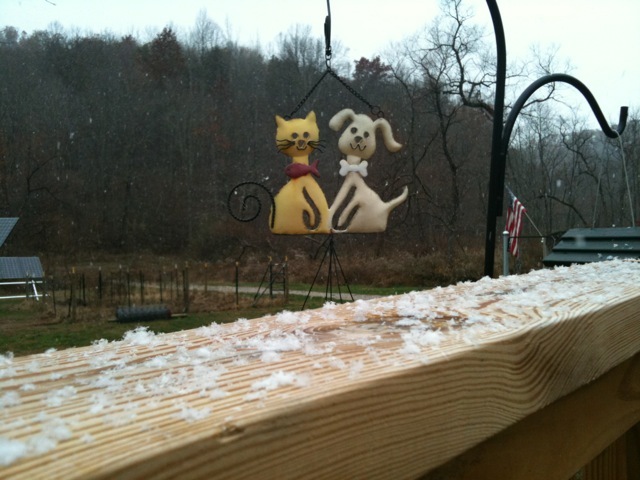 Large fluffy snowflakes fell like dandruff from the sky. Someone needs to use some Head and Shoulders Shampoo up there. Actually it is a tranquil scene to watch through our picture window. Cold and snowy outside, comfy and warm inside. The wood stove has a warm glow showing through its window and a Lodge Pot full of Great Northern beans simmers on the top. The aroma of the chicken broth and ham hock that season them scents the air. It definitely puts you in a grateful frame of mind to have these few simple things… heat and food. Life is good. 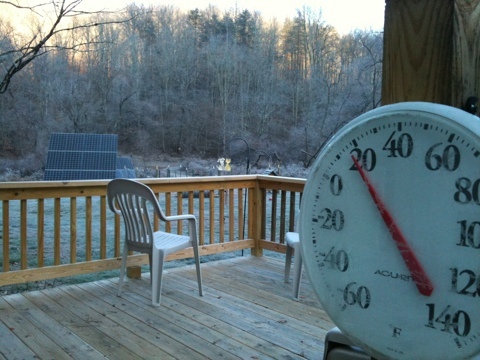 You are currently browsing the Off-Grid in West Virginia blog archives for November, 2010.